Just as George Lucas dazzles our imaginations, masterful composer John Williams continues to astound us with the brilliance of his musical vision. 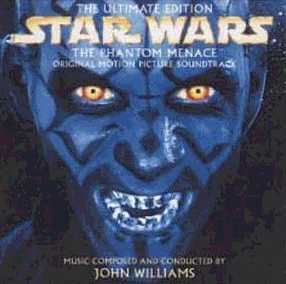 Here, with the Ultimate Edition, fans can experience uninterrupted the full force of Williams' score for STAR WARS Episode 1 - The Phantom Menace. On this double disc set, we recapture all two hours of John Williams' original film score, from his exquisite portrayals of the evil Darth Maul and the selfless nobility of Queen Amidala to smaller musical gems like the Mos Espa folk song "The Street Singer". This fully inclusive recording allows us to follow closely the story line of the film and to experience again the astounding breadth of color, style, and range that John Williams brings to his craft. So come, feel the power of the Force and travel deeper into one of the most remarkable epics of our time. Relive the high-powered intensity of the Tatooine podrace, the excitement of the Battle of Naboo, and the fury and anger of Darth Maul as he battles Jedi Knights Qui-Gon Jinn and Obi-Wan Kenobi in a climactic lightsaber duel to the death.